Early October days were among the hottest of the season. We picked a doozy of a hike for this one. Talisker is a great dog, and quite fetching (get it?). What you do after a long haul. Hunting with my brother Geoff and his son Porter was a treat. Father and son are super-fit and covered tons of ground. This one’s for Donner, Geoff’s dog, who had to stay home on their trip out this fall (this was taken in January 2015). The Kid got his very own shotgun this year, and shoots left-handed. He came close but is still looking for his first chukar. Peat took a liking to The Kid and has promised to point lots more birds for him to shoot next season. Cam was intrepidly good company. Cam gets up and down the hills with ease. Angus partnered with the shooter nicely on this Hungarian partridge in December. Dave’s Hun from last fall. Angie, Allan (with Quigley and Emma), me (with Angus and Peat), and Mike (with Paddy), on a blustery Halloween eve. Lots of birds, even more than we had dogs! Angie and Mike shared a great meal with us while camping in Hells Canyon. We hope to get out with them more next year in their new stomping grounds. Treat-hounds take a break from the action. Bryan is the figure in the upper left. He can move. His dog Bodie is up there somewhere, too. I wasn’t able to get any photos of Bryan up close. Angus, probably watching Bryan and Bodie on New Year’s Eve. This was the coldest hunt of the season, which felt even colder because we took the boat. Brr. My across-the-street neighbor Jared and his son Logan joined me for a spectacular January hunt filled with a plethora of deer, elk, and eagle sightings. Their first chukar outing, they’re eager to go again next season. The fact that my wife/BFF Leslie can share these experiences with me makes it impossible to imagine anything better. Life is good, but with her, doing this with our dogs, it is the best thing. Nice wrap up. Glad to see Peat coming along. Thanks for the pics. Really makes me psyched for next year. Love seeing the brittanies out there. Especially the old guy. 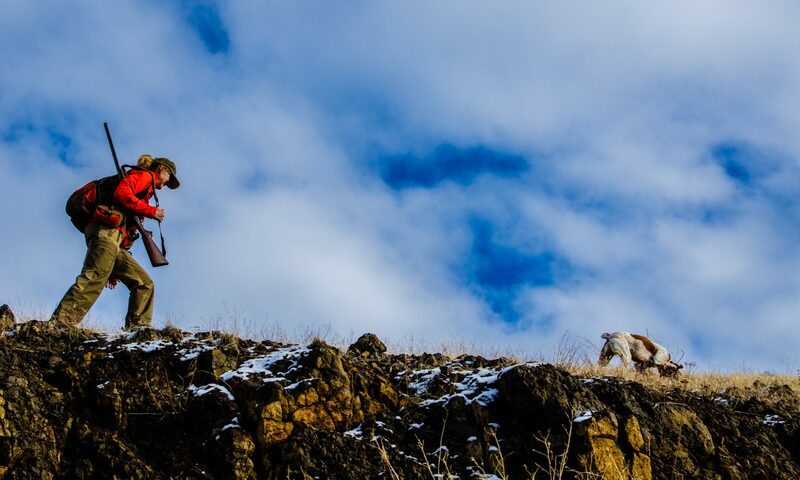 Chukar hunting is the fly fishing of hunting. Very pure. What a great year birddog puppy’s love them. Your Peat and my shorthair Cindy were the stars, next year I start running her with the other dogs new challenge’s backing etc. I really enjoyed going along with you this last season my friends and family who do not hunt to show them what I do I refer them to your sight, pictures and great videos. Hunted Montana in early Sept. for 2 weeks was going to stop and hunt Brownley as I haven’t been there since 1997 but weather was just to hot so I came home to wait for our opener in Nevada. Thanks again back to getting ready for next year (Dogs and shooting especially shooting). Love your blog and looking forward to reading more about dogs and Chukar this coming fall. Please keep it up. Thanks for sharing your experiences! Love your blog and photos. Looking forward to next season. Bob this is Derya from Turkey ,very nice to see that,you were able to get up there as many times as the weather allowled you guys. It is a shame that I only got out one time this year ,but looking forward to the coming season very much .D .Erce. Looks like you had a great year! I am glad you stuck with Peat as it looks like he will be a wonderful dog. Good Lord willing and we get beneficial weather for the hatch, 2016 could be a banner year!